We all know about Grumpy Cat, with the grumpy face and always a grumpy quote. Now imagine taking the popular building blocks of LEGO and making a LEGO Grumpy Cat that resembles The LEGO Movie Unikitty. 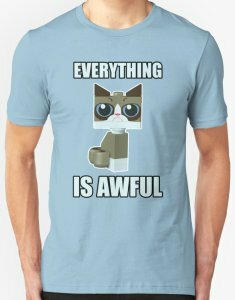 On the front of this shirt you see an image of Grumpy Cat that is a version made up with LEGO and looks just like the popular Unikitty seen in The LEGO Movie. Along with this image is a saying “EVERYTHING IS AWFUL” which is a play on the song “EVERYTHING IS AWESOME” from The LEGO Movie”. This is a unisex fitted t-shirt that is available in a wide selection of sizes that range from Small to 3XL and it comes in a choice of 17 different fun and vibrant colors. The classic look of the Grumpy Cat AKA Tardar Sauce, it is unmistakable after blowing up the internet and becoming a sensation what is next, uh oh somebody tell Grumpy Cat that Christmas is next. On this t-shirt find the large face image of Grumpy Cat in to the holiday spirit wearing a Santa hat along with the saying “Ho, Ho… No!”. You can get this t-shirt in a variety of sizes that range from Small to 3XL and choose from 6 different fun colors, it is made with 100% cotton to give it durability while also being very soft. Check out the other styles of shirts you can get Grumpy Cat on like a women’s fitted t-shirt and hoodie. 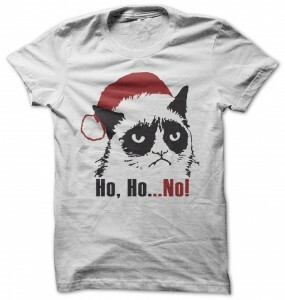 Try to have a Merry Christmas with the Grumpy Cat Ho Ho No T-Shirt.